Finding the right dog for your family requires learning which dog breeds are compatible with your lifestyle. 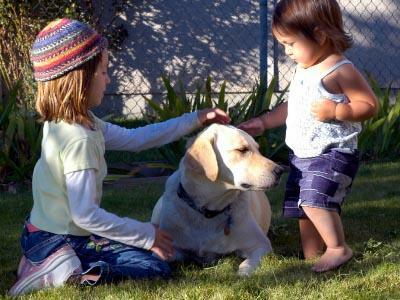 The ages of your children, the type of home you live in, and your general activity level are just some of the factors to consider when looking for a family-friendly dog. Discover which dogs are good family pets and why. As you figure out what you want in a dog, you can add to this criteria. For example, you may want a dog that will most likely be good in a home with multiple pets. Or, you may want a protective family dog versus a dog that welcomes all strangers. Early training and socializing can also make a dog more compatible to your lifestyle. Small dogs fit best in smaller homes, homes without large enclosed yards, or apartments. These dogs get adequate exercise from daily walks and play. Many will also get some of their exercise by following you around the house. Bichon Frise: The American Kennel Club (AKC) notes that Bichons are gentle and affectionate dogs that are playful and happy. Miniature Poodle: Poodles are smart, loyal and affectionate pets that are gentle with kids. Their fairly hypoallergenic coats are good for families with allergies. Miniature Schnauzer: This loyal and smart breed remains playful well into old age and is also protective. Papillon: The cheerful and loving Papillon can adapt to all types of homes, from an apartment to the country. Pug: Pugs fit well into apartment life and are calm and sweet, but also playful. Beagle: The affectionate and playful Beagle made many top family dog lists, including recommendations from Animal Planet and The Learning Channel. Many large and medium sized dogs require more space for play and exercise. These good family breeds are generally active dogs and require a lot of daily exercise, like a run in a yard and playing fetch. Labrador Retriever: The Labrador Retriever is a good pet for people who want an affectionate and energetic dog that can also go hunting, fishing or simply play fetch. Golden Retriever: The Golden Retriever makes a great pet for families who seek an active and playful dog. Collie: If you loved Lassie, you already know that Collies make loyal and loving pets for families. Collies do well with children of all ages. German Shepherd: The dog best known as a police dog is also a great family pet. German Shepherds are active, playful dogs that are good with children. They are also very protective of their families. Boxer: The first Boxers were bred to assist hunters. Yet, the modern Boxers are best known for being affectionate companions who are especially gentle with children according to the AKC. The breed is also playful, loyal and protective. Newfoundland: These famous water dogs that look like large, shaggy, black teddy bears were bred to pull nets for fishermen and haul wood from the forest. They also have helped in water rescues of people. According to the AKC, the Newfoundland's sweet disposition makes it an ideal family pet. This breed also made Animal Planet's top family dog list. Choosing a dog for your family isn't something you should rush through. It takes time to educate yourself and find the breed that is going to be the best fit. Once you narrow that down, try to visit more than one litter so you can make sure that the individual dog you choose is really a good representative of its breed. Just like people, each dog has its own personality, and this can still vary somewhat even within the breeds mentioned above. Take your time before you make your final choice, and you'll most likely wind up with a dog that your entire family will enjoy.